As an adult, Ianthe discovered many of the candles she'd been lighting were toxic! 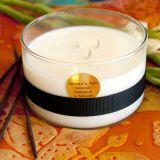 Researching the safest cleanest candles to burn for her family, she discovered organic coconut butter wax. 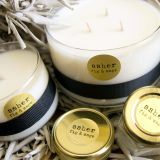 Having high standards in design, as well as quality, Objects With Purpose candles were born to deliver non-toxic sophisticated conscientious candles to everyone. 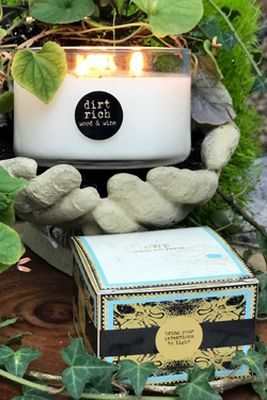 oWp encourages family and friends to make a habit of creating meaningful purpose in every day life, with the simple act of lighting a candle A natural coconut derived 100% non-toxic non GMO, bio-degradable,vegan, ecologically sound, completely sustainable proprietary vegetable wax blend. No petro-chemicals. This wax burns at a low temperature making it a soothing body butter when warm and solid perfume when cool. Artisan, small batch Hand poured in California. Glass embellished with 100% recycled grosgrain ribbon. All packaging made on the USA.